Lewis Hamilton won the United States GP at Austin today in his Mercedes GP, on a drying track - winning the 2015 Drivers‘ Championship. His team mate Nico Rosberg was second, 2.8 seconds behind followed by Sebastian Vettel in the Ferrari in third, 3.2 seconds behind the winner. 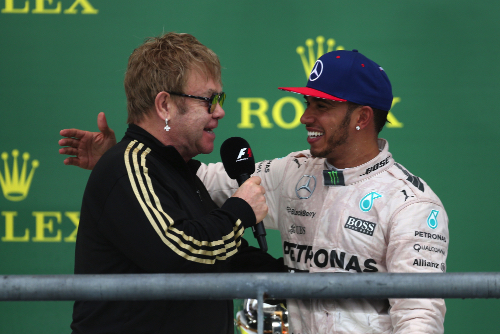 Taking his tenth win of the season and the title, Hamilton was overjoyed. Youngster Max Verstappen (22.3s) in the Toro Rosso-Renault finished in fourth place, followed by Sergio Perez (24.4s) in the Force India-Mercedes was fifth, Jenson Button (28.0s) in the McLaren-Honda was sixth, Carlos Sainz (30.6s) in the second Toro Rosso was seventh, Pastor Maldonado (32.2s) in the Lotus-Mercedes was eighth, Felipe Nasr (40.2s) in the Sauberg-Ferrari was ninth and Daniel Ricciardo (53.3s) in the Red Bull-Renault finished in the final points paying position in tenth. Before the start the rain had that plagued the event all weekend had slowed to a trickle and the sky brightened, though the temperature remained cool at 17 degrees. Rosberg is on the pole ahead of his Mercedes team mate Lewis Hamilton on the front row, followed by the two Red Bull‘s of Ricciardo and Kvyat, who have been running well in the wet, Perez and Hulkenberg on the third row, Massa and Verstappen on the fourth row, and Alonso and Grosjean rounding out the top ten on the grid. Through penalties Vettel would start 13th and his Ferrari team mate Raikkonen would start 18th. Bottas started 16th due to a gearbox change and Will Stevens would start 19th. After his crash in the morning session Sainz would start last in the Toro Rosso. The grid clears and the drivers set off on their formation lap, the track still damp but drying - all drivers on intermediate tyres. The lights go out and the race begins with Hamilton diving down the inside of the firstc orner of polesitter Rosberg, the two touch and Hamilton pushes Rosberg to the outside of the corner. Hamilton takes the lead ofver Kvyat, Ricciardo and Perez - Rosberg falls to fifth. Alonso and Massa both spin in turn one but continue. On lap 2 Sainz passes Button for tenth. Nasr pits for a new nose and soft tyres. On lap 5 the virtual safety car is deployed in order to clear debris at turn one. On lap 6 Bottas and Nasr both pit to switch back to intermediates. Bottas pits again and retires. Button complains that his intermediate tyres are worn out. At lap 10 Hamilton leads Rosverg by 1.2 seconds followed by Kvyat (1.5s), Ricciardo (1.5s), Perez (9.2s), Vettel (9.8s), Verstappen (10.8s), Raikkonen (10.6s), Sainz (11.8s), and Hulkenberg (15.9s) in tenth place. On lap 11 Grosjean retires with rear brake problems. On lap 12 Ricciardo dives down the inside of Rosberg, goes wide at the first corner then tries again at the next corner and takes second place from Rosberg. Ricciardo sets fast lap at 1m56.680s. and is 0.5 seconds behind Hamilton. On lap 14 Rosberg sets fast lap at 1m56.677s. On lap 15 Ricciardo passes Hamilton for the lead at turn 18. Ricciardo sets fast lap at 1m55.362s. Rosberg battles with Hamilton for second place, but can‘t make it stick. On lap 17 Verstappen is all over Raikkonen, the two battle back and forth for eighth place - Verstappen taking the place. Ricciardo sets another fast lap at 1m54.650s. Button pits for soft tyres. On lap18 Rosberg and Hamilton continue to battle, Rosberg taking second place. second. Hamilton pits at the end of the lap for soft tyres. Bettel and Verstappen both pit for soft tyres. On lap 20 Ricciardo Rosberg, Kvyat, Perez, Raikkonen, Sianz, and Hulkenberg all pit for soft tyres. Ricciardo leads Rosberg, Kvyat and Hamilton. Raikkonen goes off-track and ends up in the gravel fighting for grip to get going again. Vettel set fast lap at 1m48.956s. Kvyat and Hamilton are battling for third place. Rosberg attacks Ricciardo and takes the lead at turn 12. Rosberg sets fast lap at 1m46.148s, the times tumbling. At lap 22 Rosberg leads Ricciardo by 1.1s, followed by Hamilon (6.7s), Kvyat (9.0s), Vettel (9.8s), Verstappen (13.3s), Hulkenberg (21.9s), Sianz (22.8s), Perez (27.5s), and Button (35.8s). Rosbergsets fast lap at 1m43.534s. On lap 25 Hamilton is closing the gap to Ricciardo in second place. Rosberg sets another fast lap at 1m43.231s. On lap 26 Hamilton passes Ricciardo for second place into turn 12. Raikkonen is told that his brakes are overheating and he needs to pit. Ferrari retires the car in the garage. On lap 27 Ericsson comes to a slop at the exit of turn 11 - tge safety car is deployed. Alonso pits along with Vettel, Sainz, Perez and Button for new tyres - Vettel switching to medium compound tyres. Verstappen pits for tyres as well. On lap 30 behind the safety car Rosberg leads Hamilton, Ricciardo, Kvyat, Vettel, Verstappen, Hulkenberg, Perez, Button and Sainz in tenth place. Vettel on medium tyres should be able to last until the end of the race without pitting again. With Ericsson's car removed, the safety car comes in at the end of lap 32 and the racing resumes. Rosberg continues in the lead Kvyat runs wide in turn, Vettel taking fourth place from him. At turn 12 Vettel dives down the inside of Ricciardo for third, but Riccardo takes the place back. On lap 34 Vettel battles back and tkes third again after Ricciardo overbraked into the first corner. Verstappen passes for fifth. Hamilton sets fast lap at 1m42.725s. Hulkenberg passes Kvyat for sixth. On lap 36 Hulkenberg and Ricciardo make contact, Hulkenberg is out with a broken front right suspension. Ricciardo contunues. Sainz is given a five-second penalty for speeding in the pits. The virtual safety car is deployed to remove Hulkenberg‘s car. Roberg, Kvyat and Ricciardo all pit, putting on soft compound tyres. At lap 40 the race resumes with Hamilton in the lead followed by Vettel, Verstappen, Rosberg, Button, Perez, Alonso, Sainz, Maldonado, Kvyat and Ricciardo in eleventh. Alonso passes Perez and is into sixth place. Rosberg passes Verstappen for third place. Mercedes tells Hamilton he needs to pull 10 seconds over Vettel to stay in the lead after his final stop. On lap 42 Rosberg sets fast lap at 1m41.053s and closes on Vettel, and then passes his for second place. Hamilton pits for softs. Veettel pits from third and switches back to soft tyres. Sainz, Maldonado and Nasr pit as well. The order behind the safety car is Rosberg, Hamilton, Vettel, Verstappen, Vettel, Button, Alonso, Perez, Ricciardo, Maldondo and Sainz in tenth. Button pits for fresh tyres. At the end of lap 46 the safety car pulls in and the race resumes once again - Rosberg leading. Vettel chasing Verstappen for third place pacing him for the position. Rosberg runs wide entering turn 16 and Hamilton takes the lead. On lap 51 Ricciardo pits for soft tyres. Nasr passes Alonso as well. On lap 54 Sainz passes Button for sixth place. Vettel closes to 1.1 seconds behind Rosberg. Hamilton holds a 4.5 second lead. The order femains the same and Hamilton wins, with Rosberg second and Vettel third.